This is installment #3 in the “Fridge to Fork” series. If you’re interested, here are #1 and #2. 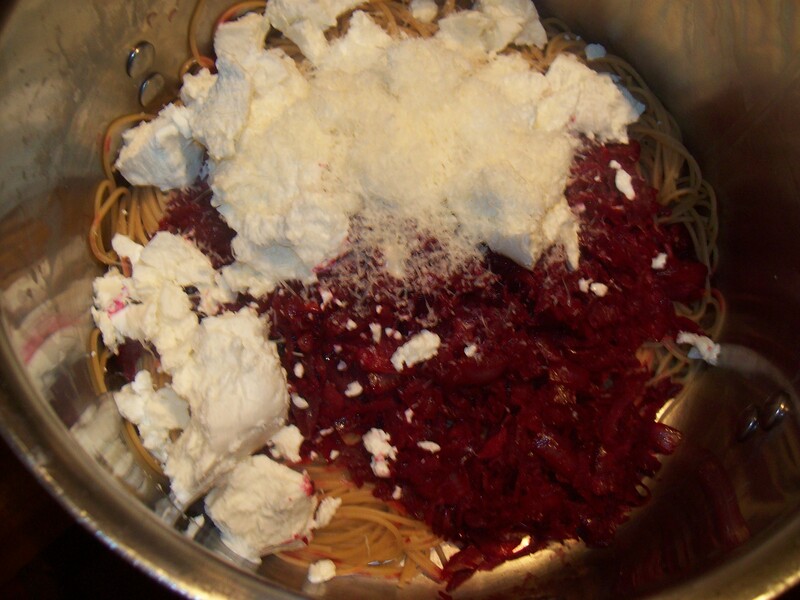 I’ve mentioned this whole-wheat pasta with beets and goat cheese before, and posted the exact recipe — but it’s so easy to throw together, and so pretty, that it seemed like the perfect candidate for a Fridge to Fork post. I didn’t have white wine or parsley in the house tonight, and as it turns out, it didn’t make a bit of difference; once again, I’m inspired to remind everyone that it’s not necessary to follow recipes to the letter to get a healthy meal on the table. 5:52 p.m.: Thank God for quick suppers. 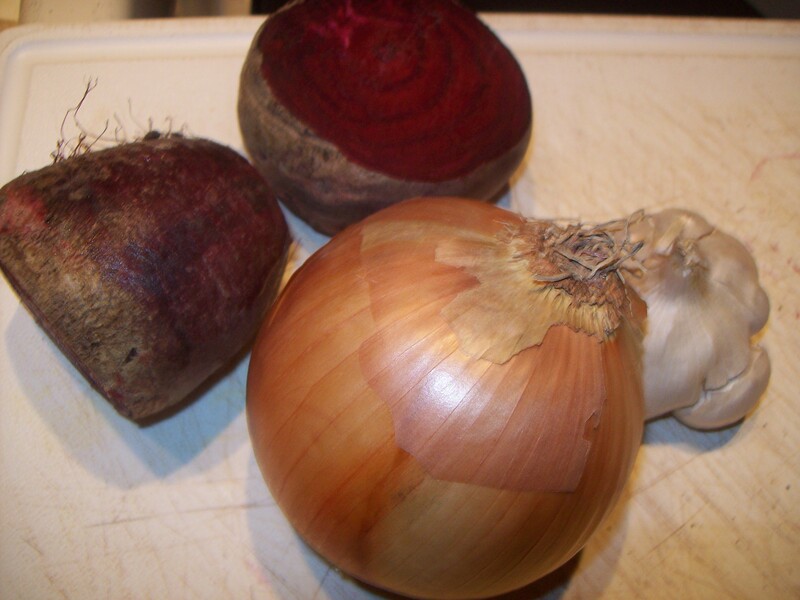 5:55 p.m.: Beets, onion, garlic, done. I love that there are so few ingredients in this. 6 p.m.: We're not eating on time tonight! 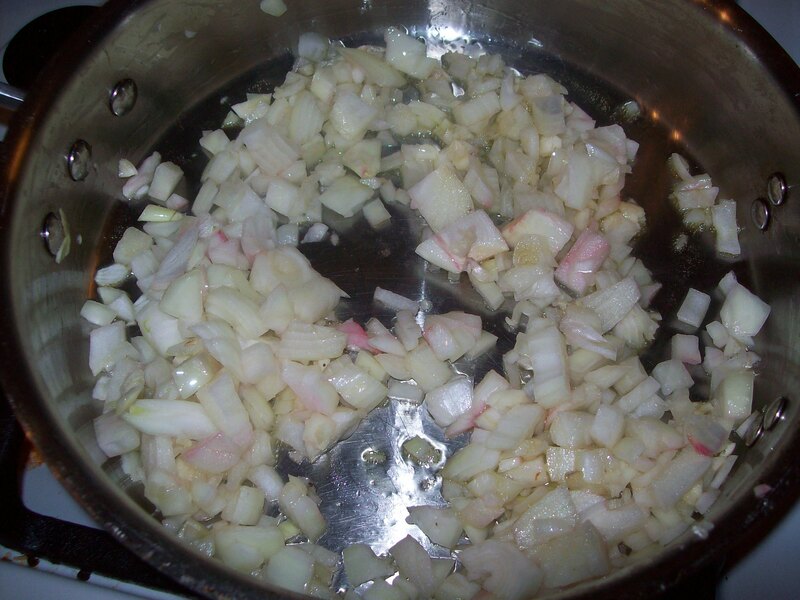 Got the onions and a few cloves of garlic chopped up and into a pan with a good drizzle of olive oil. Added a pinch of salt. Everything’s hanging out in there while I move on to peeling and grating the beets. This is AFTER I washed my hands. Twice. 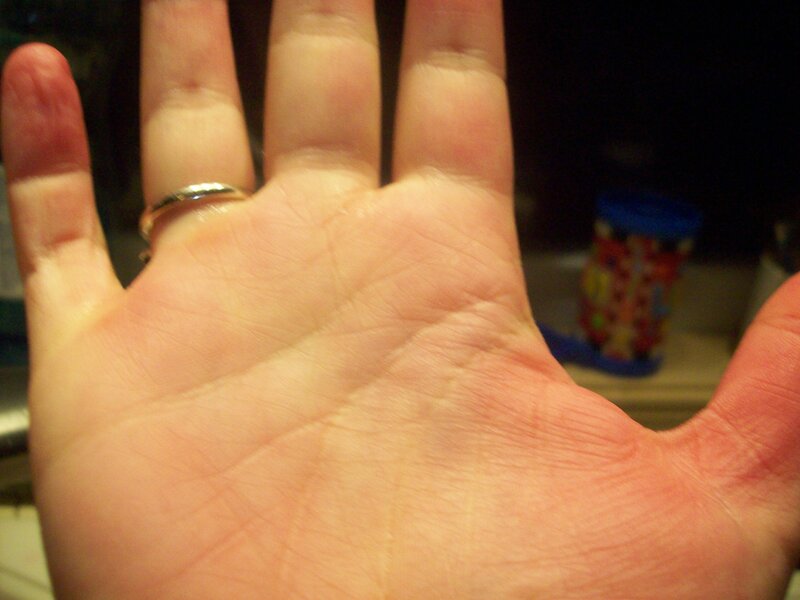 You’ll notice that grating raw beets is not without its inconvenient side effects. You could wear gloves if you wanted to, but I kind of like having magenta palms — it’s a good conversation starter at cocktail parties. If I went to cocktail parties, that is. Which I don’t. But still. I apologize for how out of focus this picture looks. I’m pretty sure it’s just that the steam from the pan kept rising and fogging up the lens. 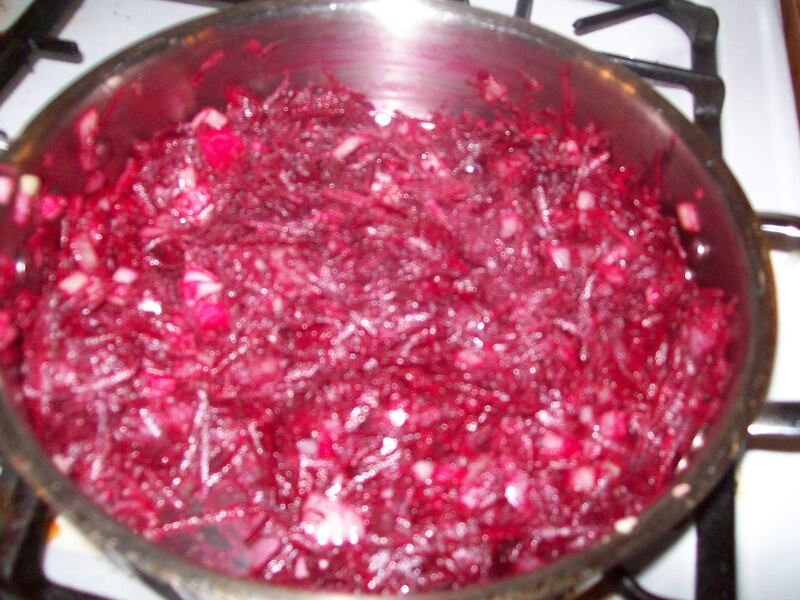 But long story short, I threw the grated beets into the pan with the onions and garlic, which were by now nice and soft and translucent. 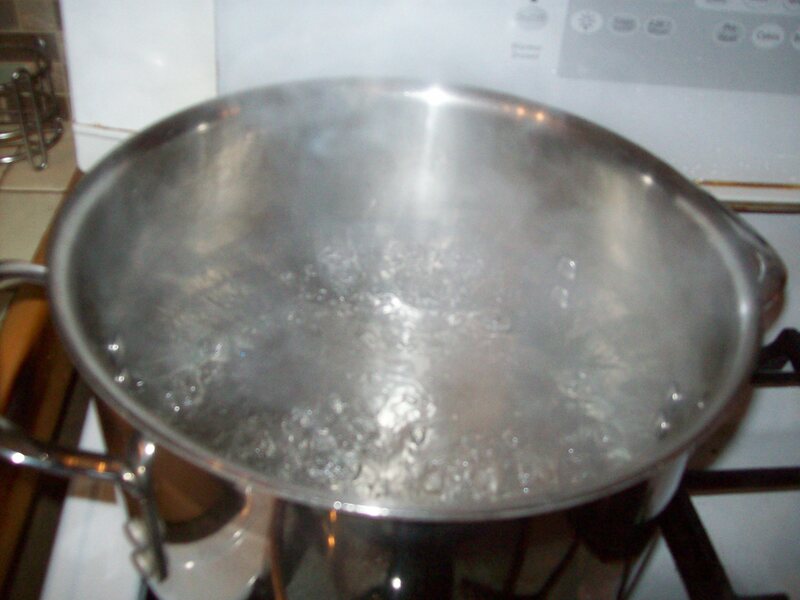 I also chucked a pound of whole-wheat spaghetti into the boiling pot at the same time. 6:12 p.m.: I swear I'm not promoting any specific brand. The 365 people don't even know I exist. 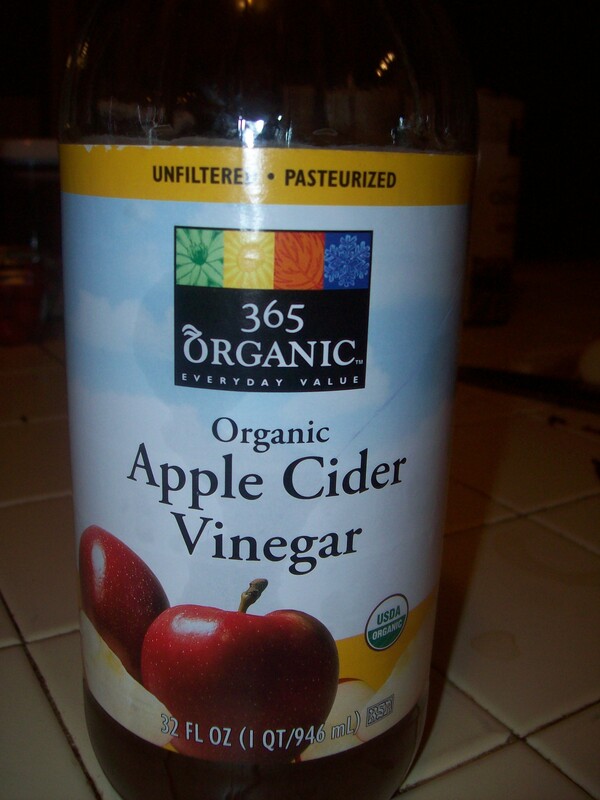 Without any white wine in the house, I grabbed a good nonalcoholic substitute — vinegar. Apples and beets work well together, so apple cider vinegar is a fine choice in this dish. Just a couple of tablespoons went into the pan with the beets. Pasta drained, beets cooked, everything ready to toss together. A big log of goat cheese and a generous shaving of parmesan went into the mix as well, along with a heavy pour of some of the water I used to cook the pasta (the hot, starchy water melts the cheeses and makes a nice sauce that will cling to the pasta). 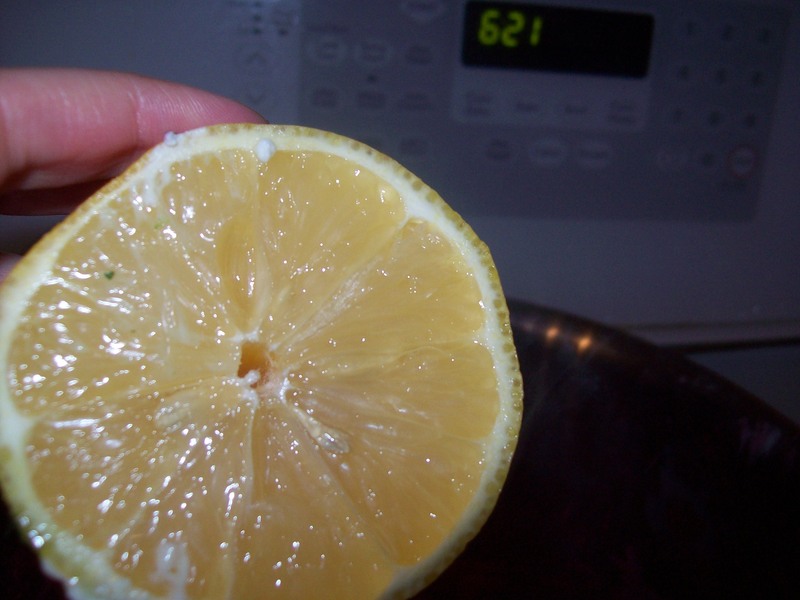 There’s a squeeze of lemon in there, too. I almost forgot about that. The best part of this meal is quite possibly the color. 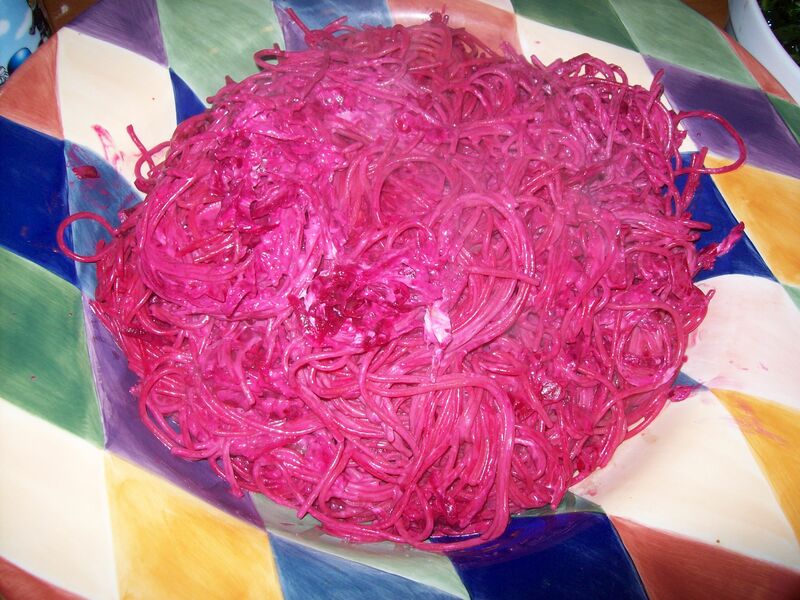 Even reluctant kids can’t resist fuschia spaghetti. With a quick side salad, this is a meatless meal that’s simple and appealing for every member of the family. P. vs. the "pink skayetti." 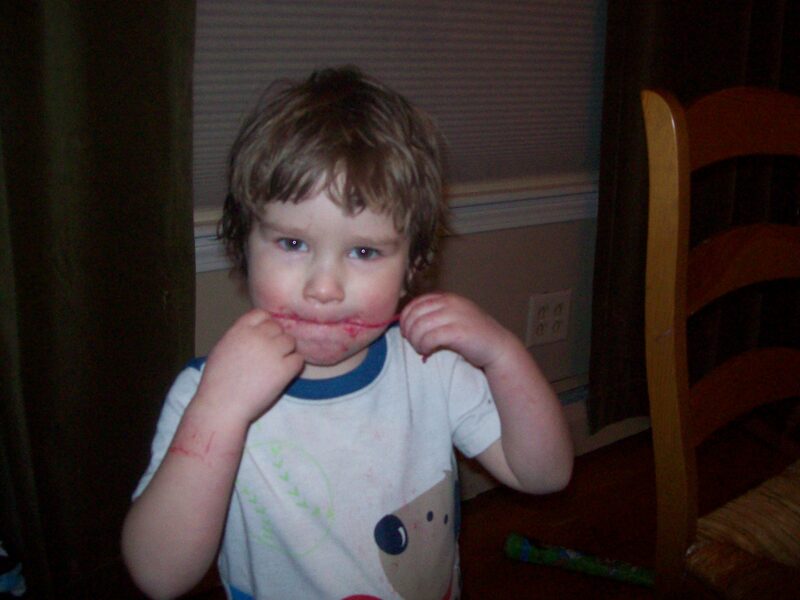 This entry was posted in Accountability, Cooking, Feeding kids, Meal planning, Parenting and tagged cooking, family, feeding kids, food, fridge to fork, Household organization, kids' health, meal planning, parenting, recipes. Bookmark the permalink. wow, wow, wow! Just made this and it is fantastic! My kids love it and I do too! Definitely going into the rotation. Yay!!!! I’m so happy to hear that! Isn’t it a great recipe? I found your blog from Claire Williamson who’s distantly related to me and I think it’s great! As a mom of three boys who was all about convenience food and now is reforming her ways: I just have to ask, how long does it typically take you to make dinner? I notice you make most things from scratch, and was wondering how long food prep takes? Thanks for the blog you make healthy eating and cooking look simple and totally doable. I am SO glad that you found my site. Thanks for reading and for your nice remarks! I do typically make dinner each night from scratch, as you noticed; but since we have two active little boys and we both work full-time, I don’t have hours to do it! The typical weeknight dinner takes me about 30-40 minutes to put together; sometimes less, almost never more. On the weekends I’ll often allow myself more time and will choose to make things that take an hour or more, but I try to keep the time commitment as minimal as possible. Some days during the week, I do 10-15 minutes of prep work for the meal in the morning before I leave for work, or do it the night before; for example, mixing the ingredients for pizza dough so it can rise in the refrigerator while I’m at work.